The Great Maine Outdoor Weekend (GMOW) is this weekend, February 10 to 11, and two snowshoe hikes will be offered by local land trusts. 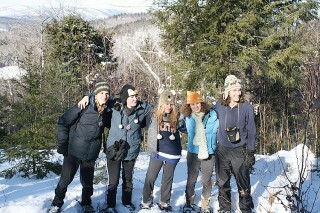 The Loon Echo Land Trust (LELT) will offer a guided snow shoe hike at Bald Pate Mountain on Saturday, February 10 at 9 a.m. while the Presumpscot Regional Land Trust along with Windham Parks and Recreation, and WinterKids will also offer fa family-friendly snowshoe nature walk on a section of the Sebago to the Sea Trail. This hike will also be Saturday, February 10 and will begin at 10 a.m. Anyone wishing to participate is invited to meet at the farm stand at Five Fields Farm X-Country Ski Area on 720 South Bridgton Road in South Bridgton. If you don’t have snowshoes, don’t worry, the Gyger family has generously donated snowshoes for the event. Snowshoes are required on the groomed ski trails. After being outfitted, hikers will pass through the Farm’s conserved land before reaching Bald Pate Mountain Preserve, protected by LELT in 1997. The rocky summit provides excellent views and photo opportunities. There will be a scavenger hunt, snowman building and animal tracking if conditions allow. Hot drinks and snacks will be available at the warming hut. Bald Pate is a popular destination for families with 500 acres conserved with a portion being in forest management, 6 miles of hiking trails, a wide variety of plant and animal species, including a unique Pitch Pine grove at the 1100’ summit. This hike is considered moderate/strenuous and will take approximately 2 hours. Proper winter clothing, snacks and water are recommended. All Loon Echo hikes are free; however, donations are always welcome. In the event of severe weather, the hike will be cancelled. Find out more about Loon Echo by visiting www.loonecholandtrust.org or their Facebook page. FMI about this and other events, contact Jon Evans at stewardship@lelt.org or (207) 647-4352. The Presumpscot Regional Land Trust, Windham Parks and Recreation, and WinterKids Snowshoe Adventure will be a fun introduction to snowshoeing and a great chance to see the Presumpscot River and Sebago to the Sea Trail in the winter. This is a great program to try snowshoeing with your family for the first time because WinterKids will be lending free snowshoes to everyone who RSVPs in advance and requests to borrow snowshoes. The program will be led by WinterKids volunteers and is appropriate for all ages. RSVP required. To register on their website www.prlt.org to RSVP. The GMOW is a series of events designed to connect friends and neighbors to the natural world and promote fun, physical activity and good health.